1. Remove cap, lift lever up from barrel. 2. Insert nib into ink bottle ensuring nib is completely submerged below surface of ink. 3. Pull lever foreward towards nib until resistance is felt (75-90 degree angle to the barrel). 4. Repeat foreward and backward action with lever for 2-4 times until no further air bubbles can be seen escaping from nib. 5.With a tissue or similar material wipe clean the front section of the pen to remove any excess ink from the filling process. 1. To clean pen, immerse the nib in warm soapy water and repeat the filling procedures above. repeat the filling and discharge procedure several times to prevent any cross contamination of ink colours. 1. Remove the pen cap and unscrew the blind cap on the rear of the barrel. 2. Immerse the nib completely below the surface of the ink and press button down on the barrel - release button, but keep the nib immersed for a further 10 seconds to give time for the rubber bladder to pull ink up to maximum capacity. 1. Remove cap and unscrew nib section from barrel. 2. Remove the empty ink cartridge. 3. Refit new ink cartridge ensuring cartridge is pushed firmly into the front section (nib holder). 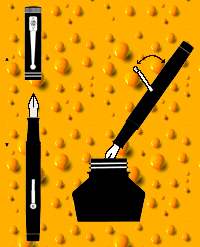 Flush liberally with warm water by holding nib section under a running tap or alternatively soak nib holder in a bowl of warm water until all ink deposits have disappeared. do not soak pen barrel or cap. 1. Remove the cap and unscrew the nib section from the barrel. 2. Remove the ink converter. 3. Twist the top of the ink converter anti-clockwise (this will expell any remaining ink- ensure this operation is performed over an ink bottle).